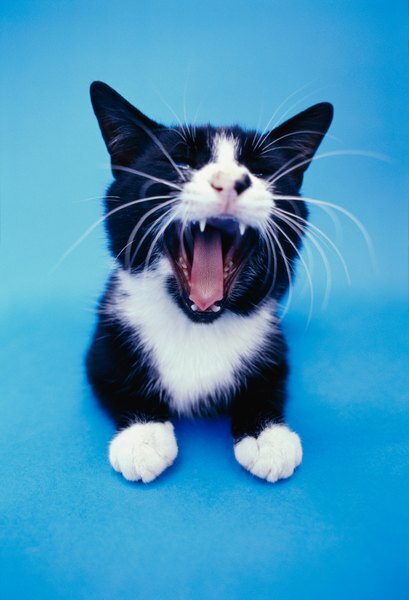 Bad chompers can cause health issues for your feline friend. Not only do kitties with dental problems have trouble eating and experience tremendous pain, their bad teeth can even lead to potentially fatal systemic infections. Just like a person, your furry friend needs regular dental checkups and cleanings with your vet to keep both him and his pearly whites healthy. According to the Cornell University College of Veterinary Medicine, 90 percent of kitties will experience dental issues within their lifetimes and 85 percent of those over 6 years old will experience periodontal disease. Your furry friend cuts her adult teeth at 6 months of age and those pearly white have to last a lifetime. Unfortunately, when your little one eats, plaque forms on her teeth and hardens into tartar within 72 hours. This buildup leads to the inflammation and swelling of the gums. Plaque can also cause feline odontoclastic resorptive lesions, which can permanently damage a tooth and its root. All of these conditions may result in tooth loss, pain, gingivitis and receding gums, according to the American Society for the Prevention of Cruelty to Animals. The most severe effects that dental problems cause for your furry friend are infections of both the teeth and gums. In some cases, an infected, pus-filled pocket called an abscess may form under one or more of the teeth. These infections not only cause pain and suffering for your kitty, but they can spread from the mouth to the heart, kidneys and joints, according to Royal Canin. Infections can also spread to the jaw, causing fractures in some cases. Without treatment, the tooth and gum infections, caused by bacteria in the mouth, can potentially be fatal if the infection spreads to other parts of the body. To prevent issues with dental disease in your feline friend, bring her to the vet for regular dental checkups, as he recommends for your little one. Your vet will check your furry buddy's teeth for signs of tartar buildup and inflammation of the gums. If necessary, he'll perform a professional dental cleaning, which is carried out under anesthesia. During the procedure, your vet removes tartar from under the gum line of your kitty and may take X-rays to check for any problems that may lurk below a problem tooth. In severe cases of tooth decay, he can also surgically remove teeth that can't be saved. He'll also prescribe antibiotics to treat any dental infections that he might find. To maintain your kitty's dental health between professional veterinary dental cleanings, brush her teeth daily using a special feline toothbrush and toothpaste. You can find such items either in pet supply stores or through your vet's office. Check your little one's gums during these cleaning sessions for signs of dental disease including red and bleeding gums, an unpleasant odor of the mouth and excessive drooling. If your furry buddy experiences pain when eating, he won't eat and needs to be taken to the vet for a checkup. Kitties who don't eat for two weeks can develop a serious condition known as hepatic lipidosis. This is a condition that affects your kitty's liver and can be fatal in some cases, according to the American College of Veterinary Internal Medicine. Is Dental Cleaning Safe in Cats? What Toothpaste Is Good for Puppies?